Click Custom Fields in the navigation pane. On the right side you see the Custom Fields section. Create a new custom field by clicking New. In the Custom Field dialog box, in the Name field, type a name for the custom field that you want to create. Select the intended location from the Location drop-down list of the field (i.e. the list in which it is supposed to be displayed). Integer: integer value without decimal point. Decimal number: decimal number with decimal point. In the Default Value(s) dialog box type a default value. Click OK. Remove a default value by clicking Reset default. You can edit an existing custom field by selecting it and clicking Edit. You can only modify default values. If you want to remove an existing custom field, select it from the list and click Delete. When a custom field is deleted, all contents of it in all projects are permanently removed from InLoox PM Web App. 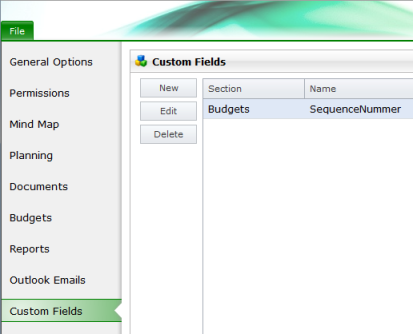 Each created custom field will have its own box on the selected project site. Enter the value in this box. Create custom fields in InLoox PM 7 Web App • Copyright 1999-2019 © InLoox GmbH. Tutti i diritti riservati.